This is a discounted collection of Sue Falsone's products. It's a mix of both digital and physical items, and you can order either or both editions. This is a discounted collection of Sue Falsone’s products. It’s a mix of both digital and physical items, and you can order either or both editions. 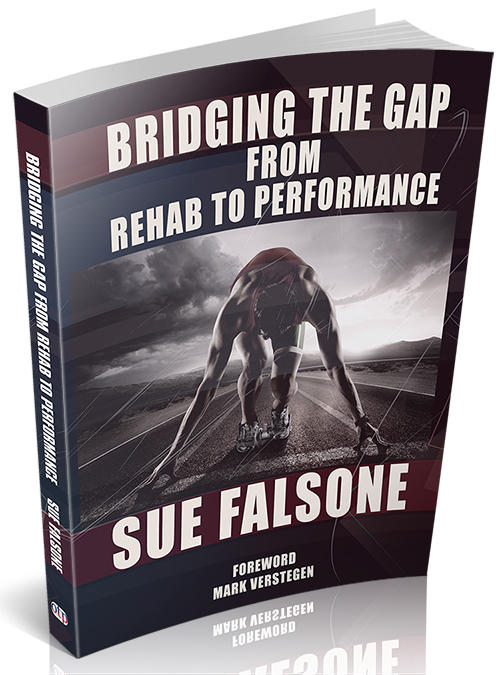 In Bridging the Gap from Rehab to Performance, physical therapist Sue Falsone walks the reader through the thought process and physical practice of guiding an injured athlete from injury through rehab and back to the field of play. To both health care professionals and strength and conditioning experts alike, she describes the path as her athletes move through pain and healing toward optimal function and advanced performance. Former LA Dodgers physical therapist and head athletic trainer Sue Falsone reveals the four common shoulder compensations found in overhead athletes, and demonstrates practical drills you can use to correct them. You’ll also learn how to identify possible issues in the shoulder so you can stop shoulder injuries before they happen. The cervical thoracic junction is an easily overlooked area that can cause significant problems in the surrounding areas, including shoulder tension and neck pain. Sue Falsone takes her experience working with high caliber athletes and demonstrates practical exercises and strategies you can use to alleviate problems in this area of the body. Sue Falsone is known among her peers as the go-to gal for T-spine knowledge, and in this lecture, The Thoracic Spine -- The Missing Link to Core Stability, we learn how she got that reputation. Physical therapist Sue Falsone uses yoga for strength and conditioning with her athletes, and in this talk she explains how and why.